"Our team of experts will monitor the data your life produces -- your location, activities, products, conversations, groups -- to keep you on track and reach your goals. We'll provide motivation and support when you need it, where you need it." The email address for more info is listed as lifeincontext@gmail.com. I haven't tried contacting them. The e-mail address actually works! 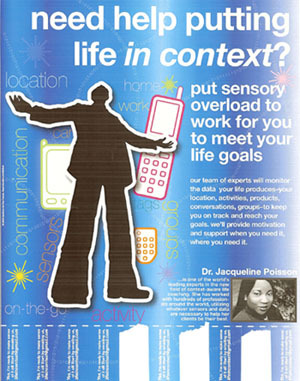 Dr. Jacquelline Poisson has a striking resemblance to a woman known as LaVita on iStockPhoto; this photo looks identical to the one in the poster. And you found this how, Joe? I was browsing around iStockPhoto collection for some personas to use on the Interrelativity web site; although I didn't use LaVita in the mix, her photos were [obviously] rather memorable. Does this remind anyone else of the "Existential Detective Service" from I Heart Huckabees? Hilarious.